The area containing the Village of Los Ranchos has been settled by humans for at least 2500 years. During the Spanish Colonial period, there were a series of adobe villages scattered throughout the North Valley, including a community settled around a small plaza called San Jose de Los Ranchos. After New Mexico became United States territory, this community was actually the Bernalillo County seat from 1850 to 1854. Los Ranchos and the North Valley were historically agricultural settlements. By 1920, however, much land was out of production because of recurrent flooding and poor drainage. 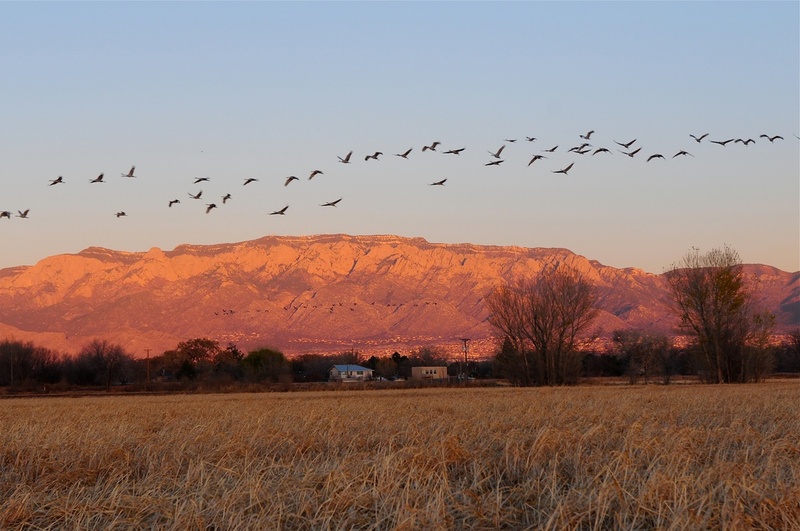 In response to this problem, the Middle Rio Grande Conservancy District was formed in the 1920's to implement drainage and flood control improvements in the area. A vast system of levees, ditches, laterals, drains and canals was created. Besides improving the situation for agriculture, this opened the area to increased development. Thus, when World War II and its aftermath brought a population explosion in the Albuquerque region, the Los Ranchos area became ripe for development associated with the growth boom. Concern over this growth on the part of local residents helped lead to the incorporation of the modern Village of Los Ranchos in the late 1950's. The Village of Los Ranchos is an incorporated municipality, which was formed under the laws of the State of New Mexico on December 29, 1958. The original Los Ranchos town site in 1958 was located between Guadalupe Trail and Rio Grande, north of Chavez, and south of Los Ranchos. The character of the community was largely homogeneous, rural and agricultural. Over the past 40 years, additional territory has been annexed into the Village. During that time, the Village has lost considerable open expanses and agricultural usage to residential development. The Village has tripled in population since 1970. The 2000 population of Los Ranchos is about 5,000. One of the more interesting historical influences still seen in lot configurations today is the linea or tripa pattern. Lineas or tripas are long, narrow lots which are typical of an older pattern of agricultural land use in the North Valley. Many families in the area, particularly early hispanic settlers, passed on land to each of their descendants in equal parts. Agricultural land in the area was worthless without access to irrigation and a roadway, so land was divided such that each lot maintained access to both. As the number of land divisions increased, the width of the lots decreased, hence the large number of long narrow lots found in this area. This pattern is probably most noticeable along the historic Guadalupe Trail but can be seen even along our commercial district on 4th Street. Many extended Hispanic families have occupied these areas for generations and continue to have strong ties to the land. A large amount of irrigation and animal raising continues in these areas, although it is difficult for the casual visitor to see because of the configuration of the lots. The Village of Los Ranchos was born from a desire for preservation of a rural lifestyle with open fields, unencumbered views and active cultivation of the land. While Los Ranchos has expanded its borders from the original territory of incorporation, we maintain a commitment to fulfill the desires of the founders of Los Ranchos. Care has been taken in this 2020 Master Plan to reaffirm our intent to carry on the traditional land uses within Los Ranchos and to maintain a rural character throughout the Village. This plan seeks to balance the desire for growth and improvement in the commercial zone with this commitment to the rural-ness that makes Los Ranchos unique and treasured. To review a low resolution copy of the 2020 Village of Los Ranchos Master Plan, please click here. Or, you may contact us. You may review it free of charge online or in person. It covers Village Form, Agriculture, Open Space, Ditches with Paths, Conservation, Preservation, Quality of Life, Historic and Cultural Resources, Community, Residential, Commercial, Transportation, Goals, Policies, Plan Implementation, Surveys, and accomplishments. If you would like to own a copy, it is available for purchase for $50.00 cash or check only.